The Baltimore Orioles visit Yankee Stadium on Saturday, September 16, 2017 to play the New York Yankees. The probable starters are Jeremy Hellickson for the Orioles and Jordan Montgomery for the Yankees. The opening line for this matchup has Baltimore at +160 and New York at -170. The Orioles have a 71-72-4 over/under record and a 69-78-0 run line mark. The Yankees are 79-67-0 against the run line and have a 75-68-3 over/under record. The Orioles have a 72-75 overall record this season. Starting pitcher Jeremy Hellickson has a 8-9 record with an earned run average of 5.23 and a WHIP of 1.25. He has 89 strikeouts over his 155 innings pitched and he's given up 152 hits. He allows 8.8 hits per 9 innings and he has a FIP of 5.66. The bullpen has an earned run average of 3.76 and they have given up 505 base hits on the year. Teams are hitting .248 against the bullpen and they've struck out 459 hitters and walked 199 batters. As a team, Baltimore allows 9.4 hits per nine innings while striking out 7.7 batters per nine innings. They are 27th in the league in team earned run average at 4.85. The Orioles pitchers collectively have given up 1,364 base hits and 706 earned runs. They have allowed 219 home runs this season, ranking them 3rd in the league. Baltimore as a pitching staff has walked 525 batters and struck out 1,118. They have walked 3.6 men per 9 innings while striking out 7.7 per 9. They have a team WHIP of 1.44 and their FIP as a unit is 4.95. As a team Baltimore is hitting .264, good for 5th in the league. The Orioles hold a .446 team slugging percentage and an on-base percentage of .316, which is good for 25th in baseball. They rank 4th in MLB with 9.2 hits per game. Adam Jones is hitting .283 with an on-base percentage of .319. He has 161 hits this season in 568 at bats with 70 runs batted in. He has a slugging percentage of .470 and an OPS+ of 107. Jonathan Schoop is hitting .302 this year and he has an on-base percentage of .346. He has totaled 170 hits and he has driven in 104 men in 563 at bats. His OPS+ is 130 while his slugging percentage is at .531. The Orioles have 1,358 hits, including 245 doubles and 223 home runs. Baltimore has walked 355 times so far this season and they have struck out 1,254 times as a unit. They have left 948 men on base and have a team OPS of .762. They score 4.73 runs per contest and have scored a total of 696 runs this year. New York has a 80-66 overall mark this year. With an earned run average of 4.24, Jordan Montgomery has a 7-7 record and a 1.28 WHIP. He has 130 strikeouts over the 138 innings he's pitched. He's also given up 128 hits. He allows 8.3 hits per nine innings and his FIP stands at 4.32. The bullpen has an earned run average of 3.48 and they have given up 379 base hits on the year. Teams are hitting .209 against the Yankees bullpen. Their relievers have struck out 586 batters and walked 199 opposing hitters. As a team, New York allows 7.9 hits per nine innings while striking out 9.6 batters per nine innings. They are 5th in the league in team earned run average at 3.78. The Yankees pitchers as a team have surrendered 1,152 base knocks and 549 earned runs this season. They have given up 177 home runs this year, which ranks 19th in Major League Baseball. New York as a staff has walked 454 hitters and struck out 1,401 batters. They give up a walk 3.1 times per 9 innings while they strike out 9.6 per 9. Their team WHIP is 1.23 while their FIP as a staff is 3.93. As a team, they are batting .261, good for 8th in the league. The Yankees hold a .441 team slugging percentage and an on-base percentage of .338, which is good for 3rd in baseball. They rank 7th in MLB with 9.0 hits per contest. Aaron Judge comes into this matchup batting .277 with an OBP of .412. He has 137 hits this year along with 96 RBI in 494 AB's. He maintains a slugging percentage of .589 with an OPS+ of 158. Brett Gardner is hitting .260 this season and he has an OBP of .348. He has collected 141 hits in 543 at bats while driving in 58 runs. He has an OPS+ of 101 and a slugging percentage of .424. The Yankees as a unit have 1,321 base hits, including 236 doubles and 212 homers. New York has walked 555 times this year and they have struck out on 1,271 occasions. They have had 1,075 men left on base and have an OPS of .778. They have scored 5.29 runs per game and totaled 772 runs this season. 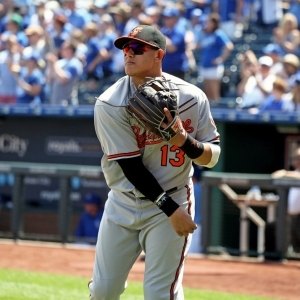 Who will win tonight's Orioles/Yankees MLB game against the spread?